One piece that didn’t make it into the recording of this week’s conversation on Boozed & Bothered’s podcast was an article from The Jack News that acted as a type of spotlight on Nebraska state senator Laura Ebke. The writers over at The Jack News gave us a story about how Ms. Ebke, who represents the 32nd legislative district in south-eastern Nebraska, faced the bullying political tactics of the GOP Governor Pete Ricketts. The rift seems to have stemmed from Ms. Ebke’s opposition to Governor Ricketts on social issues, and not from more conventional policy or bureaucratic disagreements. Elected as a republican in 2014, Ms. Ebke decided that strong armed tactics from her party’s highest ranked state official was motive enough to leave the GOP. She joined the Libertarian Party in 2016, and seems to remain very comfortable with her new affiliation. Nebraska’s legislative branch is unicameral and non-partisan, and The Jack News notes that people running for office don’t get a party affiliation listed behind their name on ballots. Not all of the article focuses on her challenges, after all this is meant to put Senator Ebke on display. The Jack News sets out a list of Ms. Ebke’s accomplishments in her first term: standing up to the bully at the top, ditching an unsure and fractured political party in a national election year for a smaller and more welcoming one, maintaining good standing with her legislative colleagues, gaining their confidence in her leadership abilities (she was selected to chair the powerful Senate Judiciary Committee), and her policy initiatives- which are focused on deregulation of markets, and reducing licensing fees that pose an obstacle for entrance into job fields (which received a joint endorsement from the ACLU and the conservative Platte Institute, a rare and welcome accomplishment for any public official). In Laura Ebke’s personal bio on her website she lists her vision and commitments to her constituents with the ease of someone who is comfortable in her own skin. This likely comes from the fact the she has lived in the area for the majority of her life, has served in local public offices, and knows her constituency (she represents over 38,000 people as of the latest census). Her outspokenness and integrity have served her well in the Nebraska Legislature. She doesn’t come across as a firebrand, but she does put her convictions into policy with confidence. The spark of common sense and disinterest in partisanship has been crucial to bridging the divides of party affiliation amongst her colleagues in the legislature. The core purpose of the The Jack News’ piece is to focus in on the re-election battle she faces from Al Riskowsky, the former executive director of the Nebraska Family Alliance. Riskowsky has the backing of Ms. Ebke’s rival in the governor’s office, and the money that goes along with party lock-step loyalty. 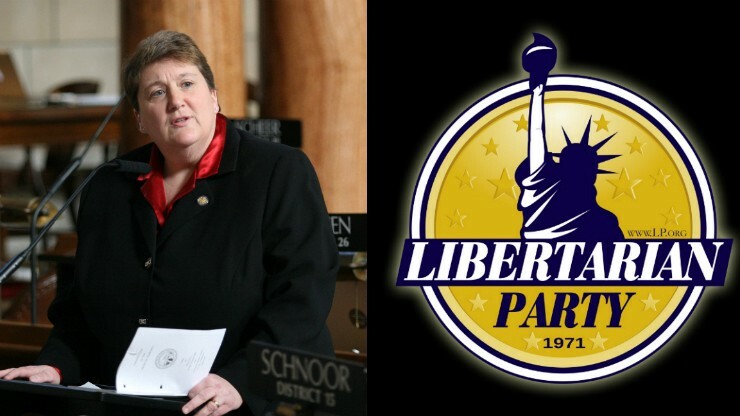 Laura Ebke is the Libertarian Party’s highest ranked elected official in the country, so the case for her re-election does have larger political implications for the LP. Of course this all comes down to Senator Ebke’s ability to maintain the confidence of the people who put her into office – those back in legislative district 32. Perhaps, with a little help from a party attempting to raise it’s own national profile, an Ebke re-election in 2018 could serve as a point of confidence for the LP while continuing their search for a person to be the face of it’s long-running campaign to position itself as the sensible option in American politics. *edit: an earlier version referred to Nebraska’s legislative branch as a “senate.” While is elected members are referred to as Senators, the body itself is simply called the Nebraska Legislature. Previous Story Previous post: Episode 1: I Guess We’re Here!